Welcome back to Giz Asks, a series where we ask experts hard questions about science, technology, and humanity’s future. Today, we’re asking snake experts many questions about two-headed snakes and how they work. The animal kingdom is stocked with all manner of uncanny creatures, but few are more harrowing and compelling than the two-headed snake. The internet is rife with videos of these oddities wriggling about, and once seen, they’re hard to forget. You begin to ask questions: Where do these creatures come from? How do they move? Do they fight over food? And can they sense, on some level, that they’re toting around at least one more head than is strictly necessary? Is the two headed snake one snake—or two? We reached out to a number of experts on the subject—people who have studied snake biology and examined these poly-domed animals up-close. As it turns out, the biological process that forms them is not so different from the one that produces identical twins. And like identical twins, a two-headed snake can be fairly competitive—each head really does have a mind of its own. The snake I had was a strange little animal. It had two necks, and they were separate—each one was maybe a quarter of an inch long, and could move independently of one another. The heads were completely formed—each one had its own brain, its own mouth, its own nostrils, its own tongue. Each head fed on fish—I fed them little yuppies. But very early on one of the heads developed a dominance over the other head, and it was more aggressive, and it would feed quicker than the other one. How do two heads move a single body? The separate heads were making decisions independently, and in movement they were not coordinated. If one of the heads decided to move to the right, then the animal would kind of wander off to the right, and then the other head might make a decision to move some other direction. They’re sending signals down to the muscles to do one thing or another thing simultaneously. This is why they usually don’t survive in the wild, because they’re uncoordinated, and they’re easy prey for predators like birds. I never dissected the specimen, but my presumption is the only part of the animal that was duplicated was the first inch and a half of the head and body. The body and tail, there was just one. And undoubtedly there was a single stomach. Humans have been fascinated by polycephalic (“many headed”) animals for at least thousands of years, suggesting that examples of such animals may have been known to humanity since antiquity. Two-headed animals are common in Greek and Roman mythology, where they were typically depicted as being fearsome and demonic, and were associated with the Underworld. In Hercules’ “twelve labours”, he is said to have killed the Lernean Hydra, a serpent with many heads, and to have captured Cerberus, a multi-headed dog who guarded the gates of the Underworld. Despite the mythological depiction of polycephalic animals as fearsome and monstrous, in reality they are anything but. Rather, they are examples of conjoined twins in the natural world—the result of incomplete monozygotic twinning (i.e., twinning from a single fertilized egg). In multicellular animals, development proceeds by the repeated splitting, or fission, of individual cells. In monozygotic twinning, the zygote divides into two separate embryos early on, which are clones that develop separately. If this division process occurs only partially, a conjoined twin may result. In humans, conjoined twins that survive past the first 24 hours after birth are very uncommon, occurring roughly once in 1,000,000 births. Conjoined twins with two heads (dicephalic parapagus) make up perhaps only 10% of cases of conjoined twins overall, and are thus even more rare. In contrast to humans, there doesn’t seem to be much data on how frequently two-headed animals appear in nature. Although it has been reported that two-headed animals may be more common in snakes than in other taxonomic groups, this appears to be an anecdotal observation that may or may not be true. Do they ever fight over food? For the small minority of polycephalic animals that survive long enough to be observed by humans, they typically have two fully-functioning brains that are both capable of controlling the same body. For an animal with two-minds controlling the same body, eating and mating are two obvious challenges that would seem to pose significant difficulties. Indeed, two-headed snakes in captivity have been observed competing for the same food (despite a shared digestive system) and have even been observed attempting to eat each other. Not good. Can you “make” a two-headed snake on purpose? For a viable two-headed snake, one might wonder whether it could be bred to produce more two-headed snakes? Generally speaking, the answer should be ‘no’ because these anomalies in development likely do not have a genetic basis. It may be true that there are genetic alterations that could increase the chances of conjoined twins, however. For example, in humans, different populations seem to have different frequencies of conjoined twins and it would be reasonable to assume this variation has a genetic basis. Some families with increased rates of monozygotic twinning are also known to medicine, suggesting the ability of genetics to have some influence. However, the appearance of two-headed snakes is thought to be a developmental accident. Thus, for the hypothetical offspring of a two-headed snake to be two-headed itself, the same developmental accident would need to occur twice. Since these accidents are seemingly random, the chances of breeding a super-race of two-headed snakes is disappointingly low. Two-headed snakes seem to be produced by a mishap early in embryological development. The classic report on them is Cunningham’s 1937 book, which documents the many ways in which the two-headed syndrome is expressed. 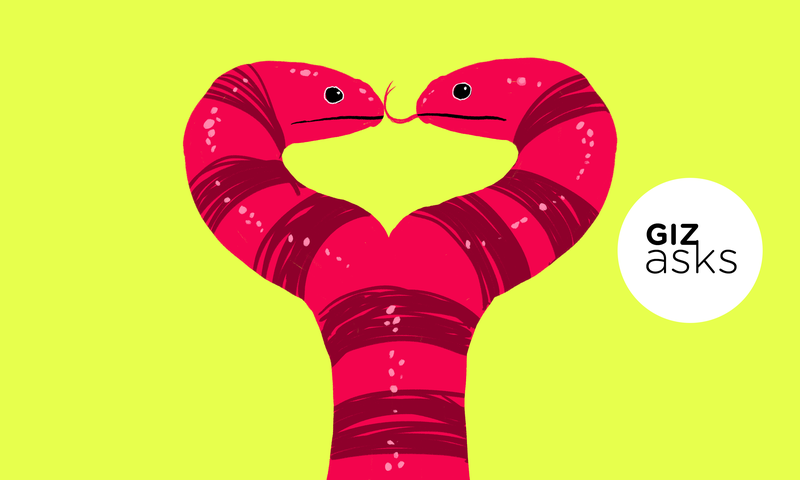 Do the conjoined snakes have different personalities? I have had several two-headed snakes in my career; the most long-lived and most studied was IM, a two headed black rat snake that lived for almost 20 years. The two heads were in one body but seemed to have somewhat different personalities and would often compete in how they would avoid obstacles and over food, even though, we often said, the food was going into the same stomach and body. Experimental studies of hunger and satiety, reported in 1993, led to the surprising finding that while each head ate readily, they had different prey size preferences and seemed to reach satiety independently. This fascinating finding was resolved when we discovered through x-ray videos of IM swallowing mice that IM had two separated stomachs! This seems to be the first such case, and again shows that two-headed animals can be diverse, and assuming that only the head is duplicated is not warranted, though frequently assumed, as we did at first. Can only one “head” be hungry? In the case of the two-headed snakes that seem to find their way into the popular media, often there are two heads that join near the neck, and then there is a single body posterior to the junction. It is unknown how much anatomy is genuinely shared. In other words, do both heads receive sensory information from all parts of the shared body? In most cases, we just don’t know. We eventually learned by x-rays that the two-headed rattlesnake had two digestive tracts inside the single body. So maybe it is no surprise that when one head was fed to satiation, the other head often was still hungry. Is a two-headed snake actually two individual snakes? But is a two-headed snake one individual, or two? Since our behavioral instincts, and our emotions, and our individually unique personalities, and our thoughts of higher cognitive function are all attributes of our brains, and since a two-headed snake has two brains (albeit genetically identical ones), it really is two individuals. Consider the difference in appetite between the two heads in the rat-snake. The left head was quite a ravenous eater, the right head a much more restrained feeder. Yet they were identical twins. We don’t have a good term for such an individual, or pair of individuals, so in our original paper on the subject, we referred to the snake as a single subject. But two brains, with differing appetite levels, attached to the same body? Quite a challenge for defining what an individual is!